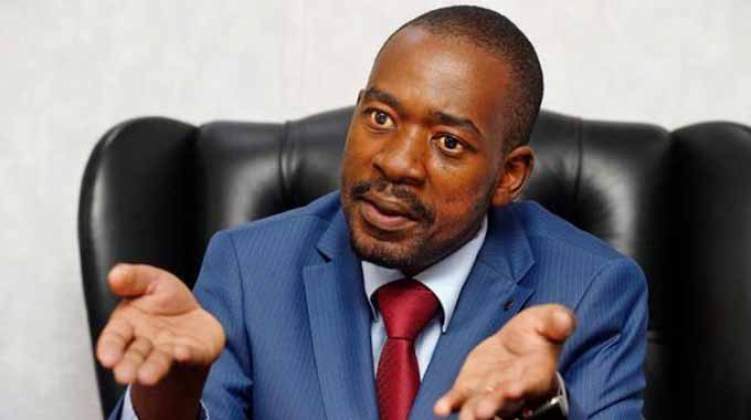 MDC leader Nelson Chamisa says the Church must lead the way in initiating dialogue between him and President Emmerson Mnangagwa so as to rescue long-suffering Zimbabweans who are staring at a bleak future. However, well-placed sources in government say Mnangagwa is unlikely to be swayed by the Church which is reportedly getting its funding from foreign countries that are deemed hostile to Zimbabwe. The insiders said the nexus between Chamisa and the Church spooked Mnangagwa from attending the prayer meeting that was organised by the Ecumenical Church Leaders Forum. But with Mnangagwa plodding ahead with his engagements with opposition parties, albeit fringe players, Chamisa said the Zanu-PF leader is behaving like an ostrich, burying his head in the sand when the economy is on its knees. "The only way forward is a comprehensive reform programme upon nation-building and peace-building to facilitate national healing and national engagement and international realignment, in order for us to deal with the crisis there must be genuine dialogue. "We have shouted our voices hoarse inviting Mnangagwa to a table of national dialogue to resolve these issues because nations are built on a foundation of dialogue, but engagement the ostrich way will not resolve our issues. "The arrogant mindset will not resolve our issues, the dog-eat-dog will not resolve our crisis, we need a credible dialogue, the churches could be a consideration, or maybe former heads of States but it must be underwritten by the international community. "This is the only answer to the cries of the people, this is the only credible answer to the rural and urban people who are suffering, we need to have a conducive environment for business, we cannot be focussing on politics all the time, the business cycle should be longer than that of politics," said Chamisa. Mnangagwa controversially won last year elections, just squeezing through the 50 plus 1 percent threshold. Although Chamisa contested the outcome in a petition to the Constitutional Court, his application was thrown out. However, the economy continues to bleed and immediate relief that was expected to come following the election is yet to arrive. Instead the United States of America extended its sanctions on Zimbabwe alleging human rights abuses and that the people on the sanctions list are a threat to the world superpower's global interests. Since the July 30 contested elections, the situation has gone from bad to worse, prices of basic commodities are going up and government's response to the economic calamities has been the imposition of more and more taxes such as the ubiquitous two percent transaction tax. "Zimbabweans are suffering, the country is in a deep crisis the crisis is a crisis of governance, the crisis of confidence the crisis of trust, in short it is a political crisis with ramifications on the social wellbeing of the people, this is all occasioned by a disputed elections, what is surprising is that eight months after the elections there is no solution, in other countries this could have been resolved," said Chamisa. Mnangagwa's plan to push for national dialogue has suffered a series of setbacks as more and more opposition parties disengage from the platform citing a lack of sincerity from the incumbent. Several high profile politicians including Build Zimbabwe leader Noah Manyika and Daniel Shumba of the United Democratic Alliance (UDA) who attended the inaugural meeting have since distanced themselves from the negotiating table citing a plethora of reasons. Critically, the parties that have withdrawn their participation claiming that Mnangagwa is not sincere and also are demanding the inclusion of MDC Alliance leader Nelson Chamisa who snubbed the dialogue from day one. In an interview, Shumba said the nation can decide for itself the character of the parties that are still in the so-called national dialogue. "Zimbabweans should be able to determine the category of those who are still on the table; however, we wish them well. "The refusal to provide a legal framework for the negotiations renders the whole platform unconstitutional," said Shumba. The former Zanu-PF Masvingo Central legislator said on Twitter that the current efforts by Mnangagwa for dialogue are designed to hoodwink the nation into believe that there is seriousness on his part when that is not the case. "The Constitution of Zimbabwe doesn't provide for such a process. The absence of a willingness to legitimise the nation dialogue renders it an adventure or circus. The UDA refuses to be blindfolded or used as an extension of Zanu-PF. The nation shouldn't expect any outcomes. "The National Dialogue fallacy is meant to clothe the fox in sheep's clothes. "The UDA won't sanitise a conspiracy or be part of a betrayal of the people's expectations. "We're not opportunists and won't be part of a process that fortifies delinquencies at the people's expense," said Shumba. Last week, Manyika also sent a letter to Mnangagwa indicating that he will not take part in the discussions because it was not inclusive. "No meaningful dialogue can happen without a neutral and credible convener being agreed on to facilitate a broad and inclusive dialogue that will include trade unionists, political parties, activities, civic groups and all stakeholders to ensure that the views and interests of all Zimbabweans are represented. Although Mnangagwa had invited all presidential candidates, the likes of Joice Mujuru who led the People Rainbow Coalition in last year's elections and a former vice president of Zimbabwe did not pitch up, while Zimbabwe Partnership for Prosperity president Blessing Kasiyamhuru said he did not attend the meeting because he was no longer into politics. "I am not a politician," said Kasiyamhuru curtly when the Daily News asked him why he was not attending the national dialogue meetings.